ATV enthusiasts flock to Little Sahara State Park near Waynoka where they can fly over dunes that stretch across 1,600 acres and are up to 75 feet tall. The hottest season of the year is all about enjoying the outdoors, cooling off and taking a vacation. Ranging from classic summer experiences to a bit of the unexpected, this list will have you bouncing from one fun activity to the next. With so many possibilities, you'll wish summertime in Oklahoma lasted forever. Blue Hole Park’s clear water makes it an ideal spot for families to enjoy a day of fun in the sun in Salina. Tiny swimmers can get wet in the shallow water, while there is deeper water perfect for underwater exploring. Make it a weekend trip and stay at the area’s RV and camping sites. It wouldn’t be summer without the juice of sweet watermelon running down your chin at the annual Rush Springs Watermelon Festival. With over 50,000 pounds of watermelon served, feel free to grab a slice or two while enjoying the festival's many carnival-style attractions and music. Let your adventurous side run wild at Little Sahara State Park in Waynoka. 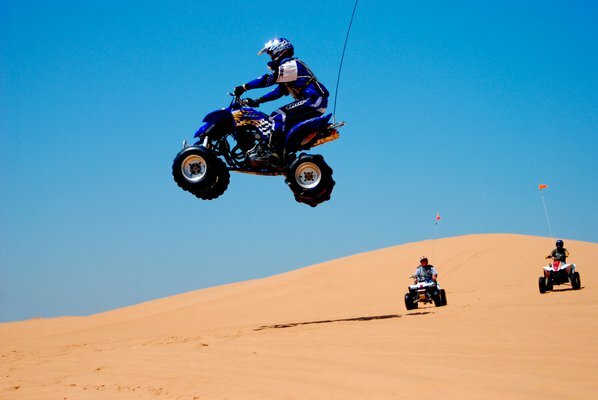 One of the best spots for ATV riding in the Midwest, these sand dunes provide hours of entertainment as you explore over 1,600 acres of sand in a dune buggy. At Mutt’s Amazing Hot Dogs in Oklahoma City, the quintessential summer hot dog can be made just the way you like it. Top your all-beef kosher frank with everything from traditional toppings like chili, coleslaw, yellow mustard and pickle spears to more exotic offerings such as smoked gouda, truffle aioli or spicy habanero peppers. Take a well-deserved break from it all and treat yourself to a romantic and relaxing evening aboard an Oklahoma River Cruise. Whether you take in the magnificent Okiahoma sunset from the boat's deck or enjoy the experience in one of the climate-controlled cabins, this hour and a half excursion is sure recharge and refresh you. When it’s time to cool off from the inside out, head to Scoops & Grinds in Collinsville to satisfy your summer craving for ice cream. Top your artisan dairy treat with Ghirardelli chocolate, nuts and whatever else your imagination desires for a seriously decadent sundae. When the summer heat is at its peak, it's hard to beat an ice cold beer. The Prairie Brewpub in Tulsa and Prairie Artisan Ales OKC are two top-tier watering holes from one of the state's most acclaimed breweries, Prairie Artisan Ales. Beat the heat at one of their twin tap houses, or check out one of the many other outstanding breweries that make up Oklahoma's booming craft beer scene. Walk through six acres of lush gardens filled with flowers in bloom at Lendonwood Gardens in Grove. Here, the sunny weather of summer invites you to stroll along paths shaded by oak trees on your way to view English terrace gardens and one of the largest rhododendron gardens in the Midwest. Oklahomans associate the summer heat with cooling off in the river, so floating the Illinois is a time-honored tradition. See wildlife including deer, fox, bobcats and birds as you camp, swim, play sports and fish along the waterfront. Feel like an explorer as you conquer the 60 miles of the Illinois River by canoe or raft. For many patrons, the Admiral Twin along Route 66 in Tulsa is tinged with memories of drive-in movies from the 1950s and 60s. Warm summer nights are perfect for rolling down the windows and enjoying a piece of open-air cinema from the comfort of your own automobile. Ludivine serves up some of the best food in Oklahoma City as well as refreshing cocktails perfect for combating the heat. Sip a Mexican Oasis made with Mezcal, lime, siracha tincture, salt, pepper and Coop Horny Toad Cerveza to see why this signature drink is a local favorite. Stay at Yogi Bear’s Jellystone Park Camp-Resort at Lake Eufaula for endless activities, comfortable cabins and great food all ages will love, or try the Marval Family Camping Resort in Gore for the perfect place to have a cook out, fish and swim close to Lake Tenkiller. Witness a Shakespearean play amidst Oklahoma's serene summer breezes during an outdoor performance by Oklahoma’s Shakespeare in the Park. Head to downtown Oklahoma City's Myriad Gardens Water Stage to see local actors bring the works of history's best playwright to life surrounded by breathtaking garden scenes. Stop in at Smokin’ Joe’s Rib Ranch in Davis for a taste of summer in the form of smoked ribs, brisket, pulled pork, crispy fries, coleslaw and potato salad. Leave room for Joe’s divine Strawberries on a Cloud, and you’ll think you’ve died and gone to heaven. With 12 acres of opportunities to slip, slide and splash, Comanche Nation Water Park in Lawton is the perfect place to cool down. Float and relax along the Endless River after trying the park’s six thrilling slides or play video games and skeeball at the Nations of Fun game center. Summer is baseball season, so cheer on the Oklahoma City Dodgers as they slide into home plate. Catch a game at the Chickasaw Bricktown Ballpark in the heart of downtown Oklahoma City to rediscover why baseball is America’s pastime and don't forget to sample plenty of delicious ballpark foods while you're there. Feel the cool morning breeze or retreat into the shade of an umbrella in the afternoon as you order breakfast or lunch at The Museum Cafe in Oklahoma City. Their delicious entrees and desserts are only made better al fresco. The city of Edmond goes crazy for summer’s biggest holiday during the week-long LibertyFest celebration. Listen to music, display your chalk art skills, peruse antique cars, fly a kite, attend a rodeo, participate in a patriotic parade and bring Independence Day to a close with one of the largest fireworks shows in the region. Secure tickets to Rocklahoma in Pryor to see some of the biggest names of 80s-era classic rock and metal play hard and fast from noon until well after midnight over the course of three days. Camp at the Catch the Fever Music & Festival Grounds, check out over 50 entertainment acts on three stages or head to the VIP tent for food and drinks. Grand Lake is home to the Duck Creek Fireworks show, one of Oklahoma’s most spectacular Independence Day displays. Secure your spot on the water as the sun goes down to see multi-colored fireworks reflecting off the lake's still waters or enjoy a variety of activities before the show starts including a War Bird vintage aircraft flyover. In Cookson, Tenkiller State Park’s clear water creates optimum conditions for scuba diving and snorkeling. Visit Nautical Adventures Scuba to learn how to get scuba-certified and then explore the sunken treasures of the scuba park at Fisherman’s Point to put your new skills to the test. Add some fizz to the summertime with a trip to POPS in Arcadia, conveniently located right off Route 66. Arrive at night to see the giant soda bottle sculpture outside of POPS covered in LED lights and then head indoors to sample over 650 flavors of soda. Take a break from the sun and cool off in the air-conditioning of the Warren Theatre in Moore. Watch the latest Hollywood hit while dining in the balcony, enjoy the comfort of a recliner in the Director’s Suites or immerse yourself in 3-D at the Warren’s World Class IMAX. Celebrate the beginning of the season with the annual Summer Solstice Walk event at the Spiro Mounds Archaeological Center in Spiro. These tours of Oklahoma’s only prehistoric Native American site explain why the mounds line up with the solstice sunset while creating a stunning view for visitors. The Choctaw Casino Resort in Durant provides great opportunities for gaming and relaxing in luxury. In the summer, take a break from the high roller games found inside to go for a dip in their outdoor pool, complete with a swim-up bar. Your cocktail under the sun will taste even better while you’re lounging in the water. Every year Maple Creek Berry Farm in Poteau welcomes families to come pick their own berries as part of the summer harvest. Grab a bucket and fill it up with a wide variety of fresh blueberries and blackberries to take home while enjoying the farm’s lush surroundings. The Oklahoma City Zoo is home to almost 1,900 animal species and even a 21,000 sq. ft. butterfly garden. Make your trip to the Oklahoma City Zoo unique this summer by cooling off at the Children's Zoo Water Stream, meeting Pearl and Piper at a sea lion presentation or feeding three types of stingrays. Make a reservation at the Living Kitchen Farm & Dairy in Depew to savor a home-cooked meal with ingredients straight from the garden. This sustainable restaurant offers small dinner parties and chic presentations of an ever-changing seasonal menu created for freshness. Get a bird’s eye view of Grand Lake when you parasail with Sail Grand Waterfront, which also offers a variety of Jet Skis, ski boats and pontoons for more fun on the lake. Feel the wind in your hair and let the scenery of Grand Lake take your breath away as you ascend from the boat’s deck to 500 feet up in the air. Rent an inner tube and relax in a wave pool with the whole family while watching a Hollywood hit and splashing around at White Water Bay. This Oklahoma City water park welcomes visitors every Friday night during the summer for dive-in movies. Secure your spot after a day of water slide fun and let the good times roll. Admire the twinkling lights of the city skyline and order a drink from the full bar on the roof of the Oklahoma City Museum of Art during their monthly Third Thursday event. This exciting event features live music, fun activities, access to the galleries, a special food and drink menu and more. Admission is just $5 after 5pm. Alabaster Caverns State Park in Freedom is home to the largest natural gypsum cave open to the public. Take a tour of the cave, pick one of the four paths of the trail system or go spelunking to escape the heat by venturing into the deep, cool underground. See where the phenomenon of hand fishing began at the annual Okie Noodling Tournament at Wacker Park in Pauls Valley. Attend this fun event and eat your fill during the catfish cook-off, enjoy live music and attend a noodling clinic while waiting in anticipation to see who caught the biggest flathead catfish at the final weigh-in. For the freshest and highest quality fruits and vegetables of the season, visit a local Oklahoma farmers market. At markets in Tulsa, Oklahoma City and Stillwater, vendors offer arugula, watermelon, raw honey, jarred jam, Oklahoma made goods and everything in between. When your lips touch a frosty mug full of Weber’s root beer, you’ll see why their secret recipe from 1933 featuring all-natural ingredients is worth the drive to Tulsa. Order it with rich vanilla ice cream as a float or as a freeze alongside one of their iconic burgers for a classic summer meal. Lake Wister State Park near the Ouachita National Forest in Wister is full of outdoor summer activities for the entire family including a water spray park for the kids surrounded by beautiful trees. Take a break from hiking or biking to get soaked from head to toe. Head out to the Lower Mountain Fork River in Beavers Bend State Park for a day of exciting trout fishing. You’re sure to catch a beautiful fish during the calm and quiet of an early morning excursion along this 12-mile stretch of water famous for year-round trout fishing in Broken Bow. Competition heats up at Lake Murray Water Sports & Mini-Golf in Ardmore as families see who can jump the highest on the nearby water trampoline and who can hit a hole-in-one during a game of putt-putt. Between activities grab a sweet summer sno cone. Feel grapes squish between your toes as you stomp the fruit later made into wine at the Canadian River Vineyards & Winery in Lexington. Sample their unique recipes for wine, take a tour of the facilities during the season's fabulous sunny weather and don't forget to purchase a bottle or two to take home with you. Grape stomping is available at special events, so make sure to call ahead. With a car show, live music, arts and crafts, food, children’s games and so much more, it’s no wonder SunFest at Sooner Park in Bartlesville is known as Oklahoma’s biggest outdoor picnic. This three day festival lines up an entire weekend of fun in the sun for the family. Summer is the perfect time to enjoy music in the open air and Oklahoma has plenty of outdoor music festivals including Jazz in June, a Norman tradition for over 25 years. Don’t miss three days of performances and clinics featuring big names in jazz and blues. Try your hand at constructing a sandy kingdom while building a sandcastle at the Salt Plains National Wildlife Refuge in Jet. The salt plains are not only a great place for family fun, but are also one of the only places to dig for selenite crystals in the world. Visit Quartz Mountain Paddle & Putt in the Quartz Mountain Resort and Quartz Mountain Fun Park in Lone Wolf for classic summer family fun. Test your luck on a miniature golf course, cool off by playing on the bumper boats and enjoy carnival style rides and food. Your one-stop shop for fun on Grand Lake is at H2O Sports Rental in Grove. Conveniently located at Candlewyck Cove Resort, they have everything you need to get high speed thrills on the water including jet skis, pontoon boats, runabouts, ski boats, tubes and wakeboards. The magnificent landscape of Green Country is even more beautiful when seen from above on a zip lining tour of Tulsa. On a POSTOAK Canopy Tour, you’ll feel the rush of traveling over 1,000 acres of forest as you fly between seven zip lining platforms on more than 4,000 feet of cable. A summertime picnic almost demands fried chicken, and as far as many Oklahomans are concerned, Eischen’s Bar in Okarche serves the best in the state. After all, an entire bird cooked to a crispy, golden brown and washed down with a pitcher of beer is their signature meal. Route 66, often called the Mother Road, is packed full of attractions, museums, destination dining and cultural performances that must be experienced. With the longest drivable stretch of Route 66 in the country, using this road as your guide is a vacation that practically plans itself. Get away from it all and be astounded by the staggering number of stars you'll see at night when camping at Cedar Lake National Recreation Area in Hodgen. Let the moonlight be your guide as you roast s’mores by the fire and fall asleep to the sound of cicadas in the summer air. For a challenging, fun and muddy way to stay cool, participate in the Conquer the Gauntlet Obstacle Race in Tulsa. Battle through an obstacle course that features 25 unique challenges including walk climbing, mud pits and much more. If you enjoy 5Ks, then the Brave the Mud Run in Poteau where you'll run through a trail completing muddy tasks is more your style. Each September, Oklahomans reluctantly say “Goodbye” to summer at the Oklahoma State Fair in Oklahoma City. Come have one last summer outing and enjoy the wide variety of carnival rides, artistic exhibits, live performances, competitions and tons of delicious fair food.